So as you know, I am heading away, and on my adventure I could not got without some vital tools of my trade. 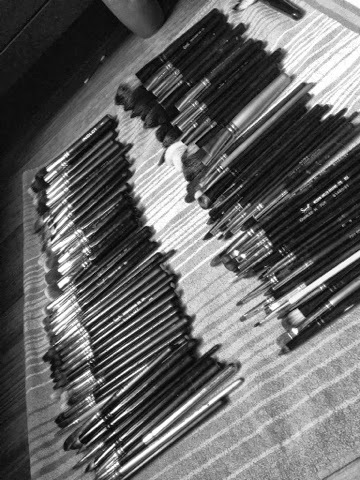 Today I got around to cleaning ALL of my makeup brushes, personal and professional. It took a little while, but a couple of hundred brushes later and some definite wrinkle-finger syndrome, I am done!! 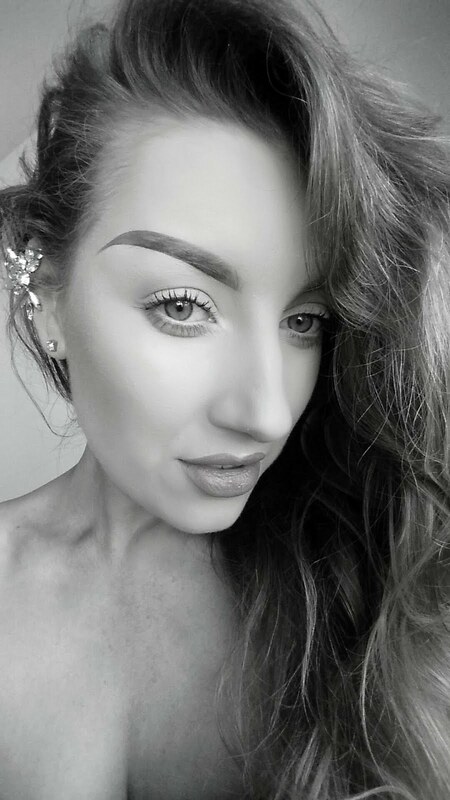 The majority of people who use makeup brushes to apply their war paint are very aware that they need to be washed regularly and shown a little bit of care and love. Unfortunately, a little bit of love can mean very different things to many different people. I have heard some horror stories about people washing their brushes. Filling the sink with water and throwing all the brushes in to 'soak'. Pulling at the bristles of the brushes. Leaving the brushes to dry standing up. Even a case of using bleach, yes I know, my heart stopped a little too, bleach!! I have had many of my brushes for years and years and they still look, feel and do their job as if they are freshly out of their packaging, so I think I know a thing or two about cleaning and maintaining brushes. I'm not saying my way is right or that other ways are wrong, however, I have found this method to work for me and for my beloved brushes, abuse free!! The only thing you need to clean your brushes are items you most probably have in your house. Warm water and some washing up liquid. You can use shampoo, baby shampoo, specific brush cleansers but I find washing up liquid to be the best. 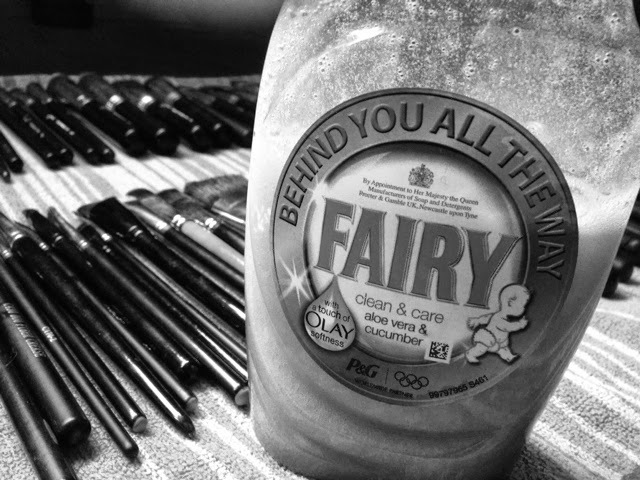 I use Fairy washing up liquid as it isn't too harsh on the bristles of the brush but yet it strips grease, oils, bacteria, and of course makeup, easily off your brushes. Using warm running water, wet the brush with the bristles facing downwards so the water does not seep into the barrel of the brush, usually the silver area in between the handle and the bristles. 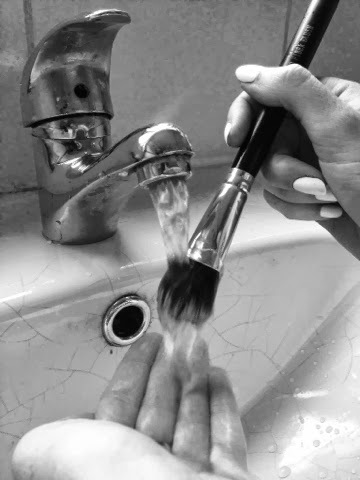 Whenever emercing the brush under water, it should always be done in this way because if not, water will loosen the glue holding all the hairs in place, the hairs will fall out and ruin your brush and your makeup! Squeeze a pea size amount of washing up liquid onto the palm of your hand. Using circular motions, stir the brush into the liquid until it begins to sud up. Rinse the bristles of your brush under warm water and repeat until the suds and water run white and clear. Be gentle with your brushes. You do not want to damage the bristles by being too rough or bending the bristles too much. Now your brush is clean you want to dry the bristles. With the brush facing down again, wrap the bristles with your fingers and gently squeeze the water out. You do not want to pull at the hairs while doing this, just gently squeeze the bristles and shape the brush to its original shape. When the excess water has been wrung-out, lay all of your freshly cleaned brushes out on a clean, flat towel in a cool dry place. This will allow the brushes to fully dry naturally in their original shape without the water dripping down into the barrel. Leave overnight.